What better way to celebrate our 125th Anniversary than to join us for the 23rd Annual Ursuline Academy Jim Keegan Golf Classic and Tennis Tournament on Monday, May 20, 2019! Located on the beautiful grounds of the DuPont Country Club, this event includes something for everyone. 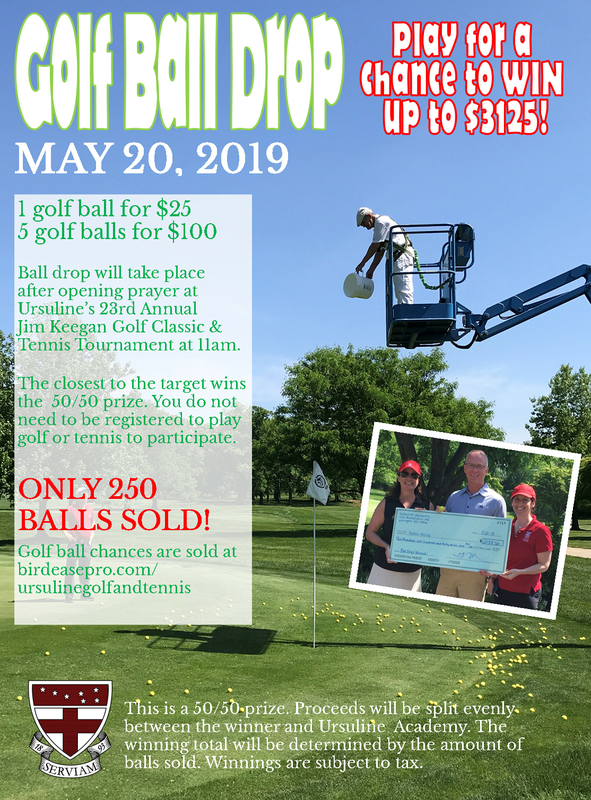 Sign up to play 18 holes of golf, participate in a round-robin tennis tournament, enjoy a BBQ Buffet dinner, or bid on silent auction and raffle items, all to benefit Tuition Assistance for Ursuline Academy. Don't play golf or tennis? Consider purchasing a sponsorship! Choose from Gold, Silver, Bronze, Specialty or Hole Levels and your sponsorship will be listed under our supporter page, in our program book, and on signage at the event. Several levels include complimentary golfers. Lastly, all are welcome to purchase golf balls for our 3rd annual Golf Ball Drop. Purchase a single ball or a ball package (under Register page) for a chance to win up to $3125! * You do not need to be present to win, so this is a great opportunity to support the outing if you cannot attend. *Prize value subject to change depending on the amount of golf balls sold.